The mission to realize this vision is articulated is summarized in the following line: “To make Uttar Pradesh a front-ranking state in India by following the path of Good Governance, Development and Social Justice.” The Party’s commitment to follow its Vision and to implement its Mission is captured in the slogan: “Na ugaahi, Na gundayi; Na mehangaayi, Na bhrashtachar; Na shoshan, Na kuposhan; Paaradarshita doordarshita hogi saakaar; Hum denge saaf-suthari sarkar.” (“No extortion raj, no goonda raj; No price rise, No corruption; No exploitation, no malnutrition; Transparency and accountability are our watchwords; We pledge to give a clean, honest and effective government.”) The Vision Document has been prepared by a 24-member committee headed by Shri Keshari Nath Tripathi, a veteran leader of the Party and former Speaker of the UP Vidhan Sabha. The BJP has already announced the names of 381 candidates against a total of 403 seats in the assembly. Of those named, 123 belong to the Other Backward Classes (OBCs) and 83 are from the Scheduled Castes (SCs). The party has also given tickets to 45 women candidates, besides five former and present state presidents and 27 former ministers. 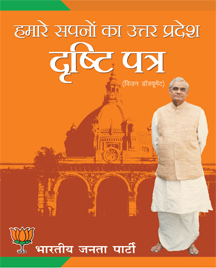 The Uttar Pradesh Vision 2012 by BJP in Hindi and English in Pdf format to read and download.